The majority of institutional care centers and orphanages in Battambang province lack resources and policies needed in order to properly reintegrate children with their families or communities, according to a forthcoming report by Duke University researchers. On any given day of the week, Mong Pheara eats rice. Rice porridge and small dried fish are her only other staple foods. Occasionally, she manages to eat a mango or a papaya. Police in Takeo province’s Bati district on Wednesday said that they were still looking for 11 men identified as the main suspects in the killing of 36-year-old Pov Sovann, who was beaten and stoned to death on Sunday by about 600 people who accused him of sorcery. Nine Cambodian workers returning home from Thailand died Friday in a car crash, the first major traffic disaster in the lead up to Khmer New Year. The opposition CNRP released a statement Friday asserting that there is no anti-Vietnamese sentiment in the party, that the word yuon is not derogatory and that such allegations are generally spread by foreigners manipulated by the ruling CPP. Som Bunnarith is looking for a job. He has two university degrees, one in marketing, another in English. He speaks Thai. He is eloquent and hard working. He is also blind and disfigured, the result of an acid attack nine years ago. A government spokesman on Friday threatened legal action over a Cambodia Daily report written in November that told how the rights to register foreign ships under the Cambodian flag were sold to a South Korean company. Nine Cambodian divers are in the final phase of training, preparing to dive in pitch-black water to recover ordnance buried in river mud for as long as half a century. 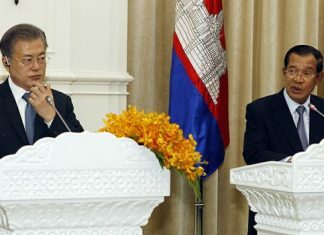 Cambodia is not prepared to join Asean’s single regional market and production base next year, a Labor Ministry official said Friday. Last year’s jump in avian influenza cases among Cambodians could be due to a mutation of the virus in Cambodia and southern Vietnam, experts said Tuesday at a meeting in Phnom Penh. They said it would be the first mutation here of the virus since it was first detected in the region a decade ago. A lawyer hired by the opposition CNRP said Tuesday that he would file a complaint next month with the International Criminal Court over crimes against humanity allegedly perpetrated by state security forces. The government on Friday finalized guidelines aimed at reducing the number of children who work in the fisheries sector and do not attend school, the Min­istry of Agriculture and Fisheries and the NGO World Vision said in a statement. An 11-year-old boy from Kom­pong Chhnang province’s Rolea Ba’ier district has died from bird flu while an 8-year-old boy from Kan­dal province’s Leuk Dek district also contracted the virus but is recovering, the Ministry of Health and the World Health Organization said in a statement Tuesday. The Institut Pasteur du Cambodge will today inaugurate a new research facility in Phnom Penh that will bring together national and international scientists to work on emerging diseases, the French Embassy said. A three-year-old boy from Phnom Penh’s Pur Senchey district passed away from bird flu this week after almost all poultry in his Choam Chao commune village died from the H5N1 virus, the Ministry of Health and the World Health Organization said Friday. The Ministry of Labor said Wednesday that the government has agreed on a final draft of a memorandum of understanding with Malaysia regarding sending Cambodian maids to work there, but that no timeframe for the signing of the agreement has been set. The environmental impact assessment that will allow for the construction of the controversial Don Sahong Dam in southern Laos, just 1.5 km from the Cambodian border, was sloppy, used inappropriate methodology, and was often based on assumptions, environmental watchdog WWF said in its own research published Monday.